This is the best mashed potato sub I have tried. No one will complain when my Keto Mashed Cauliflower with Cream Cheese and Asiago take that starchy side’s place. The best part is this reheats well. Feel free to bake it the day before and then just microwave to reheat. I was very excited when Better Homes & Gardens asked me to share a recipe with you. I’ve only been blogging for a little more than a year and this is my first guest post ever. I still can’t believe it’s on Delish Dish! How cool is that? 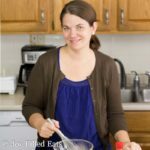 I was able to choose any recipe on the BHG site to adapt. With Thanksgiving a week away I decided to take a classic side dish and make it low carb and Trim Healthy Mama friendly. I chose Cream Cheese Mashers with Kale Pesto knowing cauliflower would work to replace the potatoes. We are traveling for Thanksgiving but I’m hoping my sister-in-law lets me help with Thanksgiving dinner. Besides the turkey, I’m hoping for a few solid low carb, THM S options. 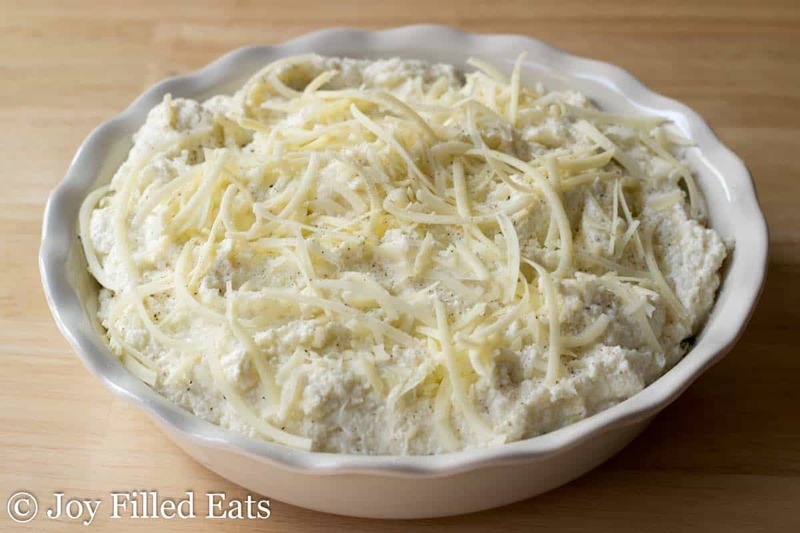 My Keto Mashed Cauliflower with Cream Cheese and Asiago is a definite. Also in the options are a healthy green bean casserole, roasted broccoli, butternut squash, and my Braided Garlic Breadsticks. I might whip up some Mini Pumpkin Cheesecakes to finish off the meal. I love cooking so much that I end up there no matter where we are for holidays. I just elbow my relatives out of the way and plant myself before the stove. Half kidding. But at the very least I come armed with appetizers, sides, and pies from my own kitchen. This is the best mashed potato sub I have tried. 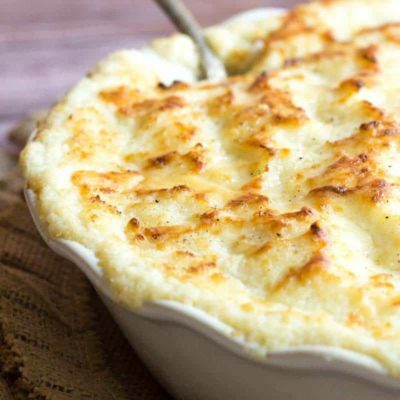 No one will complain when this Keto Mashed Cauliflower with Cream Cheese and Asiago takes its place. Put half of each of the first six ingredients in a food processor (the entire amount will not fit in a standard food processor). Process until smooth. Spoon into the baking dish. Top with half the asiago cheese. Repeat. Bake at 400 for 30 minutes or until golden, bubbly, and hot. 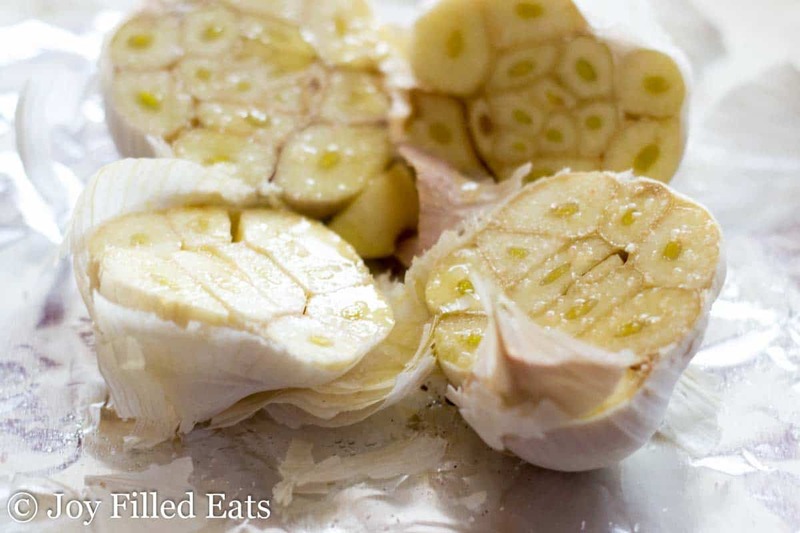 *** to roast the garlic slice the head down the middle exposing the cloves, drizzle with olive oil, season with salt and pepper, wrap in foil and bake for 30 minutes at 400. The cloves with soften enough to squeeze out of the bulb. The best part is this reheats well. Feel free to bake it the day before and then just microwave to reheat. There is a recipe in the Keto world called crack slaw. 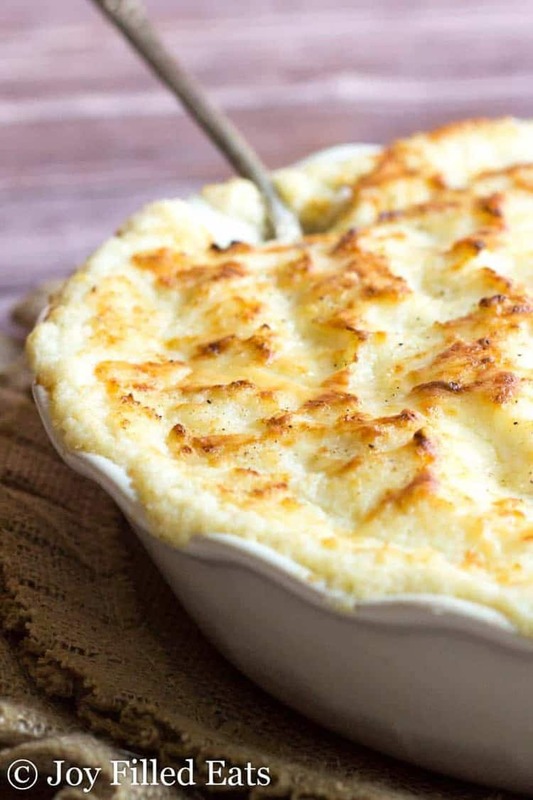 Well, this recipe could easily be renamed to crack cauliflower. I can't stop eating it. The macros are fantastic. As a vegetarian on keto, this recipe has saved me many a night, coming home from work with nothing planned for dinner. Then I think, "Mashed Cauliflower in the freezer!!" And all is right with the world again. Thanks for sharing the recipe. I'm so glad you like it! AND I'm so happy to hear it freezes well. Thank you, Sally! Made this as a trial run for Christmas....OMG it is incredible!! I will make a huge batch for Christmas because I am sure it will go quicker than the mashed potatoes! Thank you for an amazing recipe!! Is it necessary to squeeze water out of the cauliflower or does the baking take care of the extra moisture? Thanks in advance! Looking forward to trying this! I drain my cauliflower but don't squeeze out additional water. You need liquid when pureeing it so having some of the liquid helps. That's why I don't add a lot of liquid to this recipe. How much fresh cauliflower? One head? 40 oz of cauliflower would probably be 2 unless they are huge. Or just use 1 and half the other ingredients. Hello, this looks delish! Can I use fresh cauliflower instead of frozen? Yes, just cook it until it is very soft. Okay, I hate comments like "looks so good," "can't wait to try this." :\ but here goes. I have to try your version with the asagio. Oh, yum! I just tried a similar recipe from another site that used fresh rosemary. That version didn't call for the cream, but was so smooth, creamy, and flavorful, I personally will probably forego the added calories of that. Thank you so much for the inspiration. This recipe sounds delicious, I can’t wait to make it. Thanks for sharing! I have a quick question. If you take out the cream cheese does that reduce the sugar intake? Not really. None of the ingredients have added sugar. 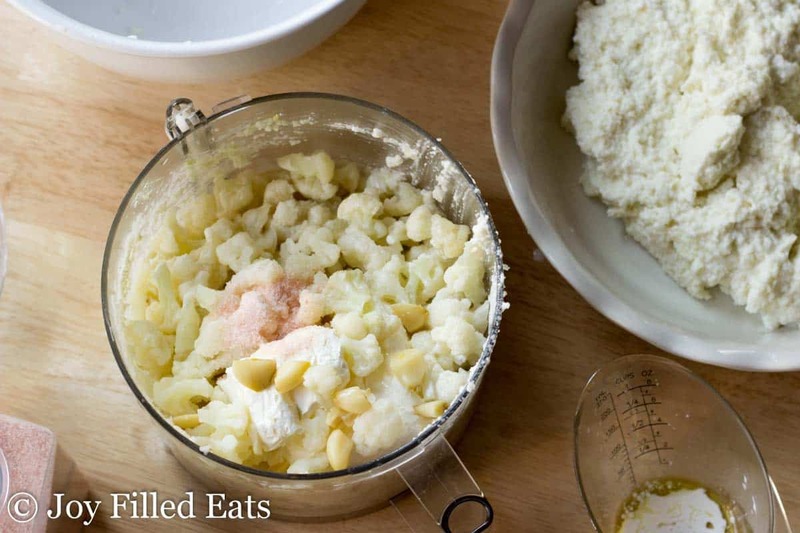 The cauliflower, garlic, and cream cheese have small amounts of natural sugars. I was reading the nutritional label, which I appreciate you posting, but I did not see the serving size. Can you please let me know how big the serving size is? Thank you. Can’t wait to try this for Easter. The serving size is 1/16th of the recipe which comes out to about 1/2 a cup. My kids hate potatoes so I was on the search to find something to use as a side dish instead. I knew they liked cauliflower so decided to give this a go. THEY LOVED IT, even my fussy eldest tried it and asked for a second helping. Ok, I admit I was skeptical... but, my husband and I are trying to eat healthier and lose some weight. SO, I have taken to scouring Pinterest for delicious recipes that we can add to our arsenal. I ran this by my husband and we both decided that we could try it. That the only way to know if we hated it was to try. OH MY WORD! I was pleasantly surprised. This was so delicious that I want it every night. LOL! I bet the kiddos would eat this and never know it's healthy! You've put lots of love and flavor in this recipe! 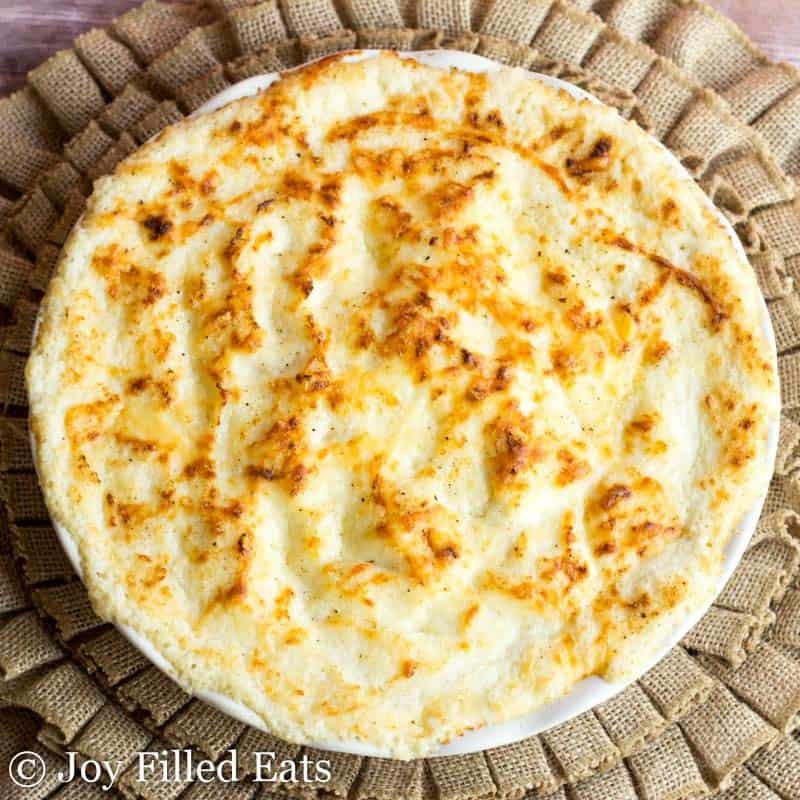 The cauliflower mash recipe was fantastic! My entire family loved it! I made this and it was delicious!!! However I have so much leftover, can you freeze this??? I wasn’t sure what would happen to the texture or flavor quality? You can freeze it. I've frozen mashed cauliflower before successfully. Not this exact recipe but it should work. What size baking dish did you use? I'm trying to gauge how many servings this will be. A deep dish pie plate. A 9x13 baking dish would probably work better. What size dish do you cook this in? I used a deep dish pie plate. Any medium large sized baking dish will work. Thank you, making this for a family dinner of about 15 people, might double and use a 9x13. But in the future for just me and my husband will use the pie dish. Thank you for sharing, can't wait to try this tonight. Hi Taryn, I'm sorry if I sound ignorant, but I can't find your "adaptations in the post text." I'm not an experimenting type of cook. After over 30 years of cooking, I still follow a recipe. I wish I didn't need to, but if I don't, our food wouldn't be edible:). Could you lead me to how you made this recipe? I would greatly appreciate it. Thanks so much for everything you share. Congratulations, Taryn! That is so exciting! This dish looks like a perfect Thanksgiving side! Congrats on your guest post! How fun! I love that you picked this recipe to re-do because it has all of those yummy flavors I crave in the fall. Congratulations on BHG, This looks wonderful! Congratulations on your first guest post! Great choice of recipe to adapt, checking it out now! This looks SO good! Heading over there now to check it out! My son love to eat mashed potatoes but is to much carbs. In it so i see that is other obtions, like colifower mash. But all so reading the instructions to how make it i see that has a lot saturad fat can i use other options to make it ? You could use less cheese if you want to cut back on the fat content. Hi Patricia, you have to click the link on the Delish Dish blog to get the original recipe on the BHG site. And then my adaptations are written out in the post. My suggestion would be to print the original and then just jot down my substitutions.